Robert Zemeckis' 1989 film imagined a 2015 filled with then-innovative tech that's actually in use today. What did the movie get right and what are the insurance implications? For the uninitiated, in the 1989 movie “Back to the Future Part II,” Marty McFly (played by Michael J. Fox) and his mentor, the scientist Emmett ”Doc Brown” (played by Christopher Lloyd) time travel in a DeLorean sports car from 1985 to 30 years in the future in the fictional Calfornia town of Hill Valley. Robert Zemeckis’ film was tasked with imagining future technology, styles, mannerisms and economy. Let’s dive in and take a look at what the film got right and what it got wrong — and discover where the insurance industry has a stake. One of the film’s most innovative pieces of technology was Marty McFly’s hoverboard, which was used like a skateboard, but without wheels. It hovered, hence the name, over all surfaces except water (unless you had a Pitbull!) through magnetic hover capabilities. The Lexus car company recently unveiled a prototype for a hoverboard, which uses the same magnetic hover technology. Like Marty’s, it can’t be used on water. Pro skater Tony Hawk tested a similar board from the company Hendo, but this toy is more like a tiny hovercraft. This board also only works over metallic surfaces. Most recently, handle-free Segways have come to market, but these still have wheels. In the movie, Marty McFly’s children use wearable technology at the dinner table to make and receive phone calls and watch TV. Doc Brown also uses silver glasses to view different cameras around the DeLorean — instead of using mirrors. And that’s not all — Doc also wears something that appears to be a smartwatch. 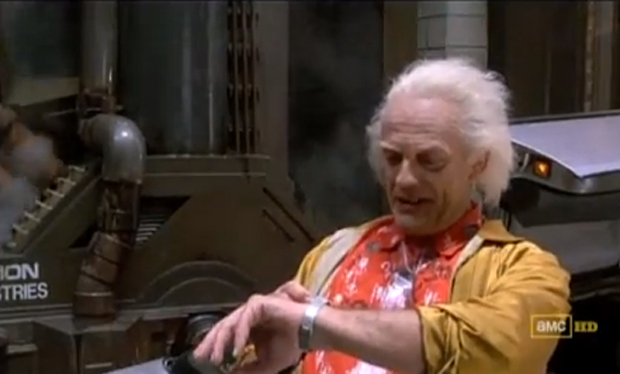 When Marty and he first arrive in 2015, it’s raining — Doc checks his “smartwatch” and predicts to the second when the rain will stop. You’ve heard of the Apple Watch, correct? Other imagined 2015 tech fashions include Marty’s self-drying coat and self-tying Nike sneakers. In a recent survey from Accenture, nearly two-thirds of insurers expect wearable technology to have significant impact on the insurance industry within the next two years. The report, “Accenture Technology Vision for Insurance 2015 — Digital Insurance Era: Stretch Your Boundaries,” also found that 31 percent of carriers say they already are using wearables to engage customers, employees and partners. Field adjusters are using Google Glass technology when handling claims, and some risk managers are using or considering wearable devices like Fitbit in return-to-work programs. In “Back to the Future, Part II,” future Doc (aka 2015 Doc, not 1985 Doc who traveled to 2015) encounters 1985 Marty who-traveled-to-2015 (got it?) in front of the Hill Valley clocktower. 2015 Doc holds out a tablet for Marty to sign to save the aging clocktower, presumably electronically. Tablets and e-signatures? This has insurance agency management operations written all over it. At the dinner table, Marty McFly Jr. checks his wearable glasses to tell his dad that “Needles” is calling. 2015 Marty takes the phone call in his office, where the film viewer sees that it is a video call. FaceTime, Skype and Gchat are staples in today’s society due to smartphones’ and computers’ front-facing camera technology. Again, this type of technology is being widely used in the claims field. Bonus: In this same scene we see 2015 Marty’s television set, which is a wall-mounted widescreen television. Extra credit goes to Zemeckis, who was able to predict not only flat panel televisions, but also that they would be widescreen in the 16:9 ratio. In fact, considering that the 2015 McFly family home has smart locks, a food rehydrator, a hovering inversion therapy device, and a plethora of e-communication tools, it’s safe to say that they live in a smart home where the Internet of Everything plays a part. For this foresight, we’ll forgive Zemeckis and Gale for predicting that fax machines will still be widely used. When 1985 Jennifer is found passed out in an alleyway, the police officers scan her thumbprint to retrieve her personal information and address. While this isn’t used by the government now, thumbprint technology offered through the iPhone 6′s Apple Pay uses a near-field communication transmitter to send payment data to a store reader. It’s not too farfetched to think that, in the near future, health records will be accessed through thumbprint technology. In addition, Jennifer accesses the McFly home through thumbprint technology via a smart lock. Today’s smart homes use codes or Bluetooth-enabled technology to unlock or locks doors from phones. “Roads? Where we’re going we don’t need roads.” Well, not in the way Doc intended. OK, the flying DeLorean isn’t even close to becoming a reality. However, as Doc points out “this sucker’s electrical,” and many drivers today choose electric autos. And while we haven’t seen flying cars, there have been huge developments as far as connected and self-driving cars. And while we aren’t quite seeing drone dog-walkers just yet, we are seeing other flying objects: Drones, in particular. Read on for 5 risks that threaten the drone industry. Well, can’t get everything right.